Do you suffer from a bad back? Sore shoulders? Aching back? Well, the chair you sit on could help to alleviate some of these symptoms. Whether you’re at home or in the office, a ball chair will provide you with a very different experience than regular seating. In fact, a chair like this can encourage you to sit up straighter, and can provide support for the middle and lower back – making typing, writing, and reading more of a pleasant experience. The Brand Fitness Ball Chair from Isokinetics comes with a supportable base, as well as a removable ball that you can use for exercise. Other benefits include a 1 year guarantee, metal frame, compact size, and the choice of two frame finishes. 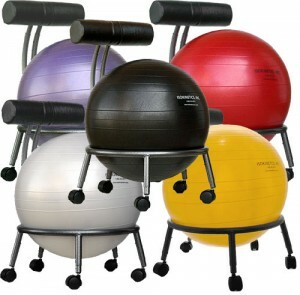 Here is a review of The Brand Fitness Ball Chair, with focus on the advantages and disadvantages of this product. The product currently has a rating of 4.2 out of 5 on Amazon.com (based on 240 reviews), and is currently ranked #42 in the exercise balls and accessories category. It is also ranked #6,915 in the entire Sports and Outdoors category. Reviews of the product have generally been positive, with customers who have purchased the item stating that the chair is easy to set up and comfortable to sit on. The chair comes with an adjustable height and base, with wheels that measure 60 mm, or 2. inches – bigger than some other products. This makes it easier to wheel the chair – ideal if you need to store it away quickly or transport it across the office. With a solid black finish, the chair has a rolling base with three wheels, as well as a comfortable exercise ball manufactured from latex-free PVC. This style choice prevents the ball from slowly deflating if punctured. You can also choose the chair in a wide range of different colors, including red, yellow, green, white, and black. You can remove the ball from the base of the chair and use it to perform exercises – ideal when trying to tone up or lose weight. The ball is similar to the ones that you would find at your local gym, allowing you to focus on strengthening your core, improve your balance and range of motion, increase flexibility and coordination, and improve your balance. You can use the exercise ball when at work or home if you have a back injury, or suffer from aching joints or muscles (the manufacturer advises you contact your physician before using the piece of equipment if you have an injury or back problems). Removing the ball from the base of the chair is easy, and a small pump is provided free of charge to inflate the equipment. The small pump that is provided with the product to inflate the ball is a welcome accessory. However, you might need to purchase an additional air pump if you use the product frequently, especially as it can take a while to inflate the product to full capacity when using this small item. However, the manufacturer has provided you with all the guidance you need when doing so, including a how-to video guide on their YouTube channel. 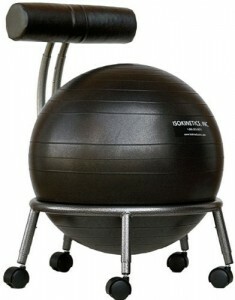 The Brand Fitness Ball Chair is a two-in-one chair and exercise ball that can help provide support for your back. With a bigger and wider wheel than other products, it’s easy to roll and comes with a high quality finish. Isokinetics are also renowned for the excellent customer service that they provide. Whether you have a query about the product, or just need some technical help, you will be able to contact a member of staff for a quick and helpful response. There are a number of ways to get in touch with a company rep, including via email. In addition, the company’s website is easy to use, with in-depth information about all of their products. Although an additional pump might be needed in order to make inflating the ball easier, everything else you need is included with the product. This cost-effective product comes with an adjustable base and height, and you can choose from various ball color choices.